This is a tank full of convict cichlids,,they are all from one spawning,,there are both pink and regular color fish in the tank,,overall there are over a hundred fish in the tank. I've bred MANY varieties of fish but I find the convict an indisputably interesting fish. For anyone interested in experiencing the behaviors of cichlids I would have to recommend these fish. Look for a page here on how to spawn them. convicts convicts convicts,what to do? 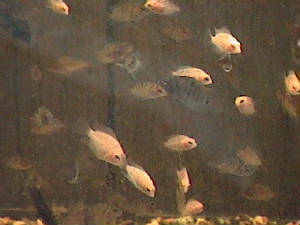 I got into breeding guppies rather reluctantly many years ago, perhaps 10 or so. Since then I've concentrated on red delta and snakeskins. These are the best sellers. Guppies can be a VERY profitable fish. 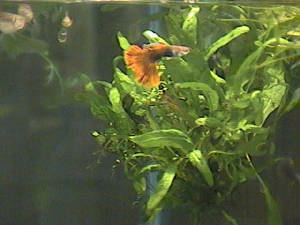 I will be including a page about guppies on this site. Hello and welcome to my fish page(s). If you are visiting here at the beginning You will see an evolutionary process,,these pages will take on a life of their own, both because of the addition of new information and as my web page building skills increase. 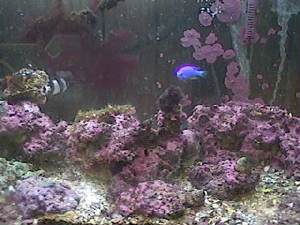 I have been in the fish hobby for over 35 years and I love to breed fish and sell them too, (poor fishies). I hope to share some of my fish interests here and I would eventually like to share some of my breeding secrets as well. So sit back and enjoy,,,come back often,,,don't be shy,,there will be new things added frequently. Please visit FishLinkCentral, I'm listed there and they are great.